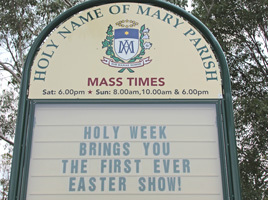 Advertising 'The first-ever Easter Show', signs near the Mary Street roundabout, Hunters Hill, alert parishioners and local people to the events of Holy Week. 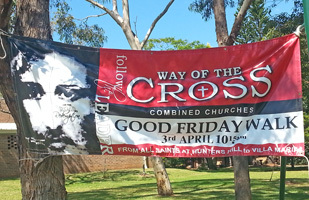 Good Friday will again be marked by the inter-Church Way of the Cross, beginning at the Anglican Church of St Mark's and culminating in the grounds of Villa Maria monastery. 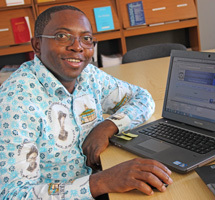 From the Marist mission in Senegal, Africa, Fr Christian Abongbung SM, sends his first newsletter for 2015. 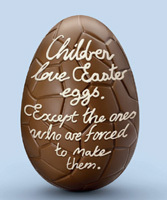 'Stop the Traffik' reports: Much of the chocolate that finds its way into our shops and homes is made with cocoa from Cote d'Ivoire plantations that use trafficked children. They are kidnapped or their families are tricked, forced to work in the cocoa plantations from an early age, for long hours, in dangerous working conditions, without any possibility of attending school. 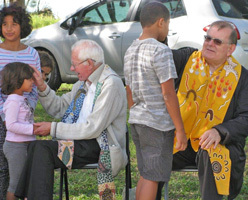 The indigenous communities of Kempsey, Macksville and Bowraville in NSW's northern rivers district gathered on Mar 21 and 22 to remember their beloved spiritual father, Fr Bernie Ryan SM. 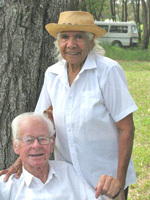 Fr Paul Sullivan presided at the simple ceremonies. 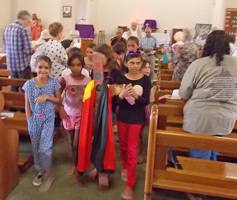 Fr Bernie's sister, Lorna Leydon (Wellington NZ) and nephew, Mark Leydon, attended, along with Marist provincial, Fr Bob Barber, and Br Mika Cilicewa, and members of the Catholic Aboriginal Ministry of the Lismore Diocese. 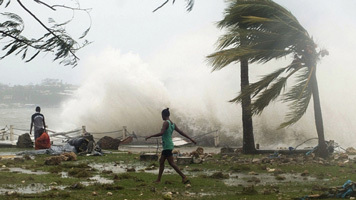 Director of the Marist Mission Centre, Fr Kevin Stewart SM, has sent out an urgent call for donations in response to the dramatic damage of Cyclone Pam. 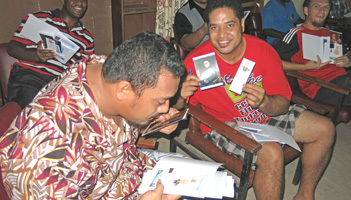 Special appeals will be made in Marist parishes in coming days. 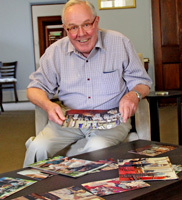 Kiwi Marist, Fr Rod Milne, visited Villa Maria monastery on Mar 17 to collect photo enlargements of the recent funeral of Fr Bernard Ryan in Sydney. 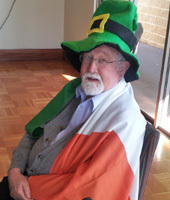 A memorial evening will be held soon in the Marist parish of Addington, Christchurch, NZ, to honour the much loved fellow New Zealander and former Superior-General. 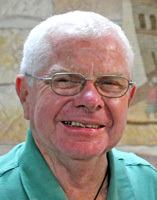 Photographs of the Requiem and burial will adorn the walls of the parish hall enabling local Marists and other friends to share in the farewell moments for their beloved Fr Bern. 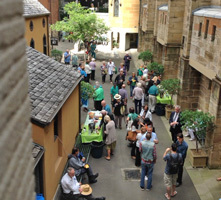 On Mar 17 Sydney-based Marists at Hunters Hill (Villa Maria and Montbel communities) and The Rocks (St Patrick's) celebrated the Solemnity of St Patrick with as much solemnity as could be mustered. 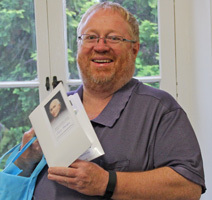 Fr Tony Kennedy reports from Marist College, Suva, on the seminary community's planning for the Year of Consecrated Life and the distribution of personalised multi-language packs of material on Marist Founder, Jean-Claude Colin. 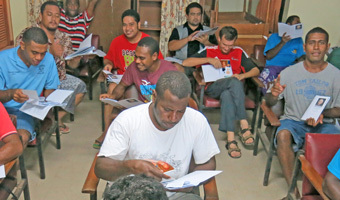 The resource packs contain material in Fijian, Tongan, Samoan, PNG Pidgin, Bislama, Solomon Islands Pijin, French and English, reflecting the range of nationalities represented amongst the Oceania Province students. 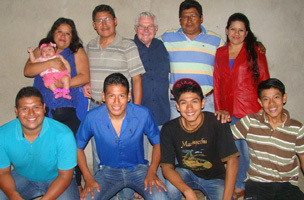 Australian Marist missionary, Fr John ['Hoppy') Hopkinson SM, sends this update from his mission in Bolivia: click here. 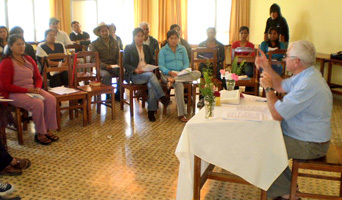 He is pictured, below, with the Marist Team at Tarija and during a presentation to leaders of Basic Christian Communities. 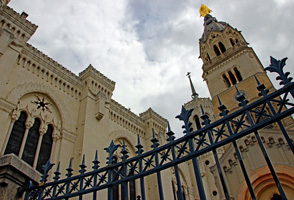 Jul 23, 2016, marks the bicentenary of the pledge by pioneer Marist aspirants to form the Society of Mary at the shrine of Our Lady at Fourvière, Lyons, France. 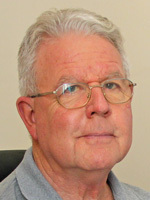 Authored by Marist writers, Frs Justin Taylor and François Drouilly, 'Ascent to Fourvière' is now being circulated to members of the Marist family worldwide. 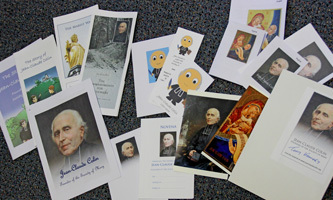 The 40-page booklet combines a succinct history of the events surrounding the 1816 pledge with a reflection for use by today's Marists preparing for the bicentenary celebrations next year. 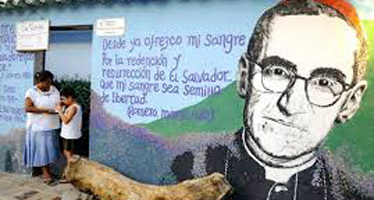 Anniversaries include assassination of Archbishop Oscar Romero (24th) and the beginning of the Sisters of St Joseph at Penola, SA (19th). Pictured, back row: Frs David Kennerley (NZ provincial) and Paul Martin (NZ); middle: Frs Gerard Hall (Aust), Bob Barber (Australian provincial), Larry Duffy (Vicar-General), Merv Duffy (NZ) and Paul Mahony (Aust); front: Frs Chris Martin and Neil Vaney (NZ), Peter McMurrich and Kevin Stewart (Aust). 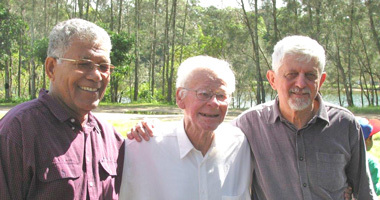 The Marist Provincial Councils of Australia and New Zealand are meeting for two days (Mar 04-05) in Wellington, NZ. Joined by Vicar-General of the Society of Mary, Fr Larry Duffy SM, the councils are reviewing matters of international configuration and collaboration. 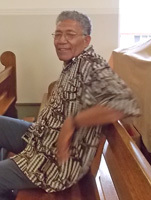 Fr Larry is in the midst of visitation of the Oceania Marist Province. 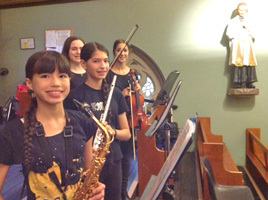 Sure enough, the historic city-centre church in Sydney's 'Rocks ' rocked, thanks to the students of Marist Sisters College, Woolwich, NSW. 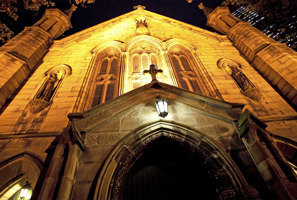 St Patrick's has a long tradition of music in the liturgy for most of its twelve weekend Masses. From the Society of Mary's headquarters in Rome comes a handy booklet to help with personal and community reflections on the Year of Consecrated Life proclaimed recently by Pope Francis. Extraordinary peaks in daily visits marked this web site's February experience. Following a January mean of 628 visits daily, February's average jumped to 982, sixteen days receiving more than 1,000 visits. 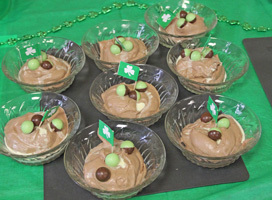 The surge peaked on Feb 06 with 1,345 visits. 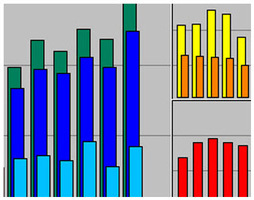 The last few days of the month saw a more normal average daily visit count of approx 700. Phew! 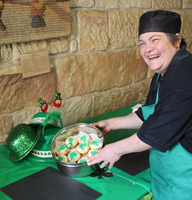 February issue of Marist Europen bulletin now available. Click here.